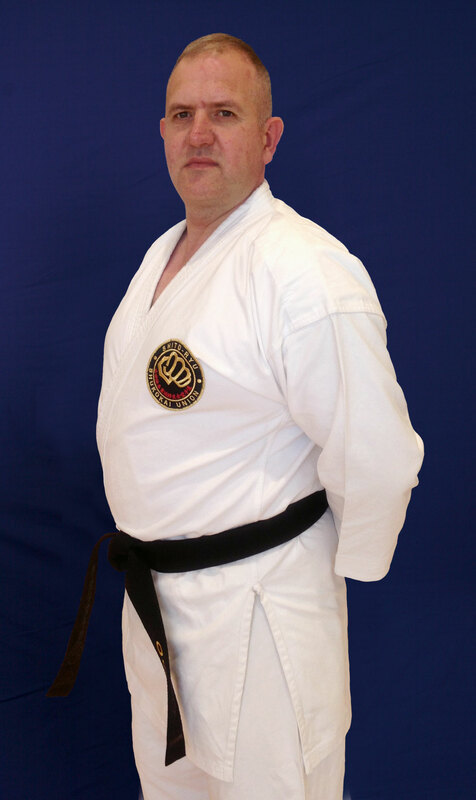 Steve started studying Karate in 2001 at a Shukokai Karate club in Gorton, Manchester. 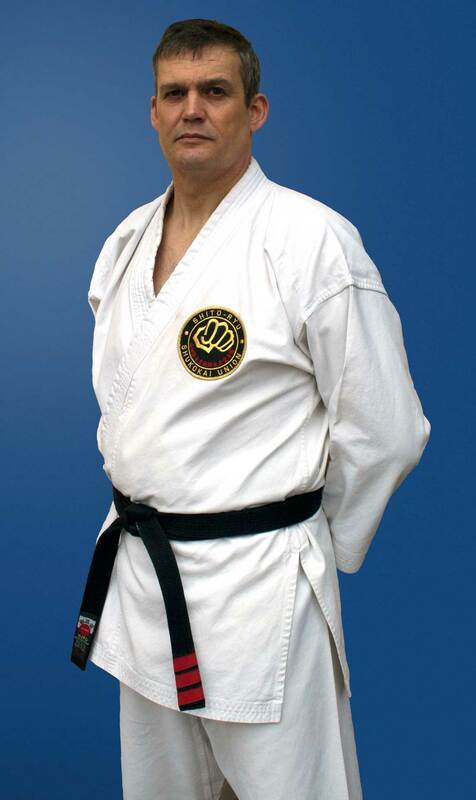 His instructor at the time was Tom Scott 6th Dan of the Shinji Ru Karate Association. At that time Steve was looking for somewhere to take his two young children to learn some self-defence and found Toms Dojo, after sitting through a couple of lessons he decided that he would ask if he could join the adults class as he had always wanted to give Karate a go. Steve stayed with Tom until 2005 when an injury at work meant he had to take some time off from Karate and this coincided with Shinji Ru starting to use weapons on a more frequent basis to supplement their training, this was an interesting part of Karate for Steve as well as pure traditional Karate. A friend who had left Shinji Ru before Steve, recommended a SKU (Shukokai Karate Union) club based in Stockport, after meeting the Instructor he asked if he could join his club and the SKU along with his two children, by this time Steve and his children were all all 3rd Kyu. After gaining 2nd Kyu Steve asked if he could help instruct the children’s class and also help out with the lower grades in the adult class. During his time with the club Steve entered several competitions with varying degrees of success and himself and his two children (who by the way, were far better than he was - success wise - in competitions) all graded from 3rd Kyu through to 2nd Dan with the SKU and were graded by Sensei’s Knighton, Gee and Warburton. In 2013 Steve opened his own club, Manchester Shukokai Karate Academy whilst a member of CMAA (Cobra Martial Arts Association) under Sensei Andy Morrell. However, he felt that the club needed to belong to a pure Karate association with a real traditional ethos of teaching a very good standard of Karate, and so was fortunate enough to come across Denis Casey Sensei (8th Dan) and the Shito-ryu Shukokai Union UK, an association which followed the eclectic teachings in Shito-ryu and Shukokai of the late Master Tani, now under Soke Haruyoshi Yamada (10th Dan). After meeting with Sensei Casey, Steve went straight back to the club and at the very next lesson asked his students if they would agree to the move and become members of the SSU UK, but if they didn’t want to then he would find them a club, the students unanimously backed his decision and in March 2014 were accepted within the SSU association and changed the name of the club to Openshaw Shukokai Karate Club to reflect this. Since joining the SSU UK it has revitalised Steve's appetite for Karate especially the Budo side of it and he trains at least once a week with Sensei Casey, who is a true Karateka and never ceases to amaze him with his Karate, power and sheer depth of knowledge about the art, it's history and techniques. The SSU UK are a very friendly association and have made Steve, his students and his club very welcome. It is always a pleasure to attend the open courses and be taught by the senior grades of the SSU UK. Steve was given permission by Sensei Casey to attempt the grading for 3rd Dan, and in May 2015 he was fortunate to grade and attain the rank of 3rd Dan - Sandan. Steve would like to thank all of his past and present instructors, the students he has trained with and those he has taught. They have all made an impression on Steve in one way or another and he will always be grateful to every Karateka he have come across and those he has yet to meet. 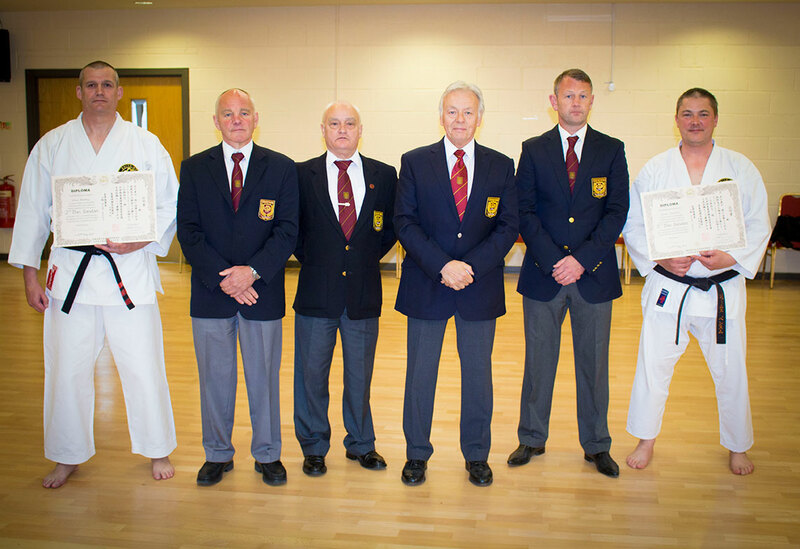 Top right - Steve Buckley - Bottom right - Steve after being awarded his 3rd Dan, along with Chris Mileham [7th Dan], Tony Grainger [6th Dan], Denis Casey [8th Dan], Barry Williams [6th Dan] and James Bentham who also received his 3rd Dan). Steve started karate in January 2014, his confidence & self esteem was low and by his own admission he was unfit and wanted to lose some weight and get a little fitter, he always wanted to try karate but his confidence was an issue and he would never pick up the courage to take the first step. He met Steve Buckley Sensei in early January 2014 and Sensei Steve explained what they do at his dojo and Steve felt a little easier about joining in. He'll never forget that first session as it was a beasting and he pushed himself to his limits in the cardio work they did that night and even though he felt exhausted he felt good and better than he had for some time. Steve attended regularly in the adult classes and gained the rank of 8th Kyu (Yellow belt) 3 months later. This was a massive confidence boost for him and he felt he had found something he really enjoyed doing and with the people he trained with as the club had a really good group of people there all very friendly and helpful. Steve quickly got the bug for competitions and added a few medals to a collection for both kumite & kata. Steve attained the rank of 4th Kyu (Purple belt) in 2015 and asked if he could assist Sensei Steve with the junior dragons club. Steve really enjoyed this and carried on with assisting with the junior grades every week. Steve felt this helped his own training as well as helping the juniors. Steve attained the rank of Shodan (1st Dan) in May 2017. Steve feels karate has helped him in the way he conducts his whole life, his confidence has increased immeasurably and it has helped with his job and personal life. Steve would like to thank everyone at OSKC for their help and a massive thank you to Steve Buckley Sensei for everything he has done for him.